For all of Gloria Swanson’s sturm und drang the movie’s secret weapon is William Holden. The Movies as Life, Part Two: “It’s the pictures that got small,” silent screen star Gloria Swanson famously declares in this vivisection of Hollywood. For all her sturm und drang, however—and notwithstanding her final stairway descent into the white fire of the camera—the movie’s secret weapon is William Holden as the desperate young screenwriter she sexually possesses. Holden was coming off a long callow career that was trailing into nothing when he took over the role from Montgomery Clift, who would have matched Swanson intensity for intensity and sent the whole enterprise up in smoke. Detached and filled with self-hatred, performing as a surrogate for co-writer-director Billy Wilder—who arrived from Vienna only 16 years before without knowing a syllable of English and in short order mastered the vocabulary of contempt—Holden bears witness to the absurdity of not just his own situation but the industry itself. 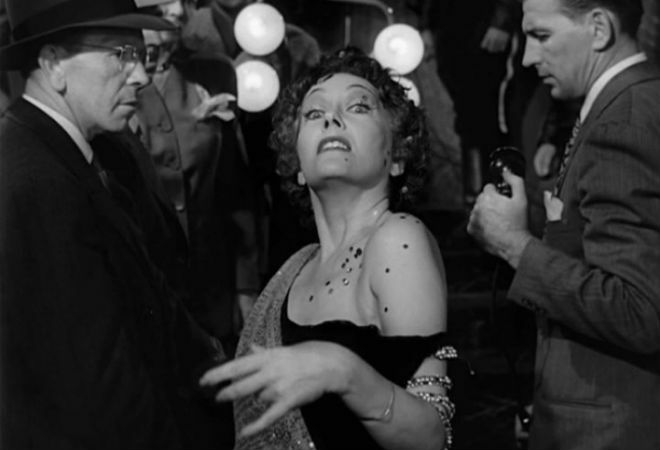 Hollywood howled with displeasure (Louis B. Mayer screamed at Wilder at an early screening) and then in the dead of night, via the anonymity of the secret ballot, nominated Sunset Boulevard for 10 Academy Awards, before giving almost all of them to All About Eve, that vivisection of Broadway.